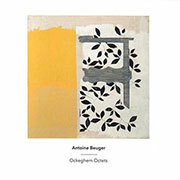 In my mind I’ve worked up Antoine Beuger as my personal nemesis. Never met him, but his music has always aroused a vehement antipathy, sufficient for me to have resolved to avoid further encounters wherever possible. (The only other composer I’ve singled out for this treatment, more or less arbitrarily, is Wolfgang Rihm.) Whatever I’ve heard has always struck me as being imprisoned in theoretical purity, beholden to presenting an idea at the expense of any musical considerations; a dry, academic routine left to run its course. I found it devoid of aesthetic interest, but never in a way that challenged or provoked, and so felt no need to pursue it further. So, when Another Timbre sent me their new recording of Beuger’s Ockeghem Octets last week, I thought it would be the perfect opportunity to demonstrate my impartiality by getting really stuck in. I’m happy to report that those hopes have been dashed. This is quietly intriguing music. Maybe I needed to hear more Beuger after all, but what seems to set this piece apart from previous works I’ve heard is that the idea here focuses on musical considerations. Each page of the score contains two lines of four tones. The tones are all to be played long and softly. Four of the musicians play one line of tones, each in their own time, and the four others play the second line. This recording realises twenty-five of the fifty pages of the score. There’s a simple scheme in play here, not unlike some of my preferred music by Eva-Maria Houben. From this simplicity, a pleasing subtlety is allowed to emerge. As the title suggests, the piece is an homage to Ockeghem and Beuger observes that each page of the score “constitutes a kind of double canon”. The structure of the piece – musicians independently playing shared material within loosely-defined time-frames – bears a clear similarity to Cage’s late ‘number’ pieces. Indeed, the sound-world of soft, overlapping pitches strongly resemble many of those works. There are distinct differences, however; borne out of differences in musical thinking. Firstly, Cage wasn’t one to think in terms of canons. Each page is circumscribed as a miniature, self-contained piece. Where Cage allows some interpretive freedom, Beuger stipulates long and soft notes throughout – those ‘lines’ of four tones take, in this recording, 2-3 minutes each. With potential for harmonic and textural complexity thus reduced still further, other qualities come to the fore. The instruments (flute, alto flute, melodica, concertina, harmonium, accordion, cello, e-bow zither) divide differently between the two lines on each page, producing strangely sophisticated tone-colours. The mix of instruments used here, combining “high” and “low” cultures, brings out unexpected beating frequencies and other acoustic phenomena. It’s a work that lovingly exemplifies the beauty of instrumental sounds, all through simple play that removes any faint traces of didacticism that linger even in Cage’s most beguiling works. It figures that I must have been missing something all this time. Still wary of diving into Beuger’s back catalogue, but now because I’m worried I’ll spoil the mood. How does a composer respond to the modern world? Do you try to shut it out as a distraction and risk irrelevance? Or do you try to engage with it and risk co-option to commercial and political interests? Are you sufficiently aware of the changing currents in society, able to record them in such a way that your music doesn’t grow as stale as last year’s fashion? Synergy percussion ensemble is approaching their 40th anniversary and commissions a new work to mark the occasion. They ask Anthony Pateras, who responds with an hour-long percussion sextet using over 100 instruments, with electroacoustic improvisations, written over two years. 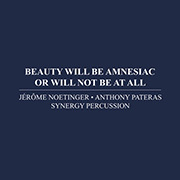 Now released on CD and download, Beauty Will Be Amnesiac Or Will Not Be At All is a huge, ambitious work, far beyond a celebratory showpiece for technical virtuosity. The title immediately recalls a misquote of Breton’s dictum, “Beauty will be CONVULSIVE or will not be at all.” In fact, it’s a direct quote of the conclusion to Sylvère Lotringer’s essay The Dance of Signs. As with all the releases on Immediata, the music comes wrapped in ideas. The disc is accompanied by a booklet of interviews between Pateras, Lotringer and Jérôme Noetinger. Presently, amnesia is impossible because we are immersed in the omnipresent archive of the Internet. The techno-utopia we have collectively bought into makes it more difficult for creative processes that consciously seek new worlds, because the weight of the past is magnified and indulged. If we cannot forget, how do we stumble on the beautiful? Lotringer replies, “Surprise doesn’t surprise anymore. It’s already inscribed in the machine.” Cage typically liked to see the bright side of the emerging postmodern condition (we will become omni-attentive, i.e. electronic) but Lotringer cites another quote from Cage, on the need for art to “help us to forget” when we “drown in an avalanche of rigorously identical objects.” Right now, as any tech billionaire will tell you, information is an industry, rapidly defining for itself its own standards of manufacture and reproduction. Pateras notes that ubiquitous technology has given us a surfeit of self-representation, at the expense of self-awareness. In a cultural sense, technology has allowed us to be consumed by inertia. How to break this hold? A percussion work too often asserts a return to primal origins, an attempted negation that in fact is a regression to accumulated cultural baggage and prejudices. Beauty Will Be Amnesiac Or Will Not Be At All makes a regression of a more complex kind. It starts out sounding like a recording from the 1950s, the highest frequenices deadened, a faint hiss and rumble throughout. Despite the appearance of tape recorders later in the piece, at this stage everything is in fact acoustic, all sounds created by low, muffled percussion instruments of various types. An invisible act of technological disorientation. The music is difficult, virtuosic in its complexity of composition and performance, but never in a flamboyant way. The polyrhythms and timbral shifts between instruments form a coherent hole, with no single voice standing out for display. Throughout the piece, the percussion is overdubbed with improvisations by Pateras and Noetinger on Revox tape recorders, reproducing, manipulating and distorting the percussion sounds. At times, the percussion sextet’s playing acts as an armature for the electronics, and at other times, vice versa. For all the small-scale restlessness in making the sounds, and the large-scale flux in densities and textures, the piece feels curiously monolithic. It creates its own meaning, leaving it to the listener to discern. The question of whether the electronic and acoustic here exist in symbiosis, or instead prey upon each other in turn, is effaced by the electronic technology appearing to be obsolete (tape, open reels). To a less obvious extent it is also effaced by the ‘primitive’ percussion including highly-developed instruments and newer inventions such as Xenakis’ Sixxens. Freed from the distractions of being “cutting edge”, technology here is embraced for its truly disruptive properties, over an empty gesture of futilely attempting to renounce technology. Percussion and tape introduce complexities and complications which digital technologies have tried so hard to expunge. We are living now in the half-forgotten legacies of the last century, from a time when first percussion music, and then tape, were seen as means of liberating sound. The use of older technology here is not an act of nostalgia but of taking up again a promise of the future left unfulfilled. If the music here seems foreboding, it still may be a utopian alternative to digitally-enforced cheerfulness. I bought 10 Edition Wandelweiser CDs for 50 Euros and now I’m posting tweet-length reviews after drinking beer in the sun. A study in self-knowledge triumphing over self-expression, allowing the personal to speak for the universal. She calls them ‘pictures’ and I love how reductive and transparent these pictures are. Sophistication is heightened simplicity. An acoustic version George Harrison’s Electronic Sound LP. How to present sound as subject without diminishing the power of composition. Open format gives acoustic and digital samples equal stature. How to turn Stockhausen’s Mikrophonie I into a Harry Bertoia sculpture. Congratulations, I guess. I plan to discuss this in greater detail in the near future. Like a transcription of von da nach da. The rigorous economy of playing seems natural and gentle, as though fulfilled. It’s a nice day so I’ll just leave the windows open and pretend this CD is playing. Earlier quartets by Frey. Heard now in retrospect they reveal an exploratory nature, quietly restless (just not on the surface). The Keller trios are so brief they make the larger works by Johnson and Kudirka seem equally ephemeral, hard to pin down.